My sister Mary and I are only two years apart. That is a tight time frame. Some sisters who are so close in age instantly become thick as thieves, we were not those sisters. Let’s just say the first twenty years of our lives were colorful. 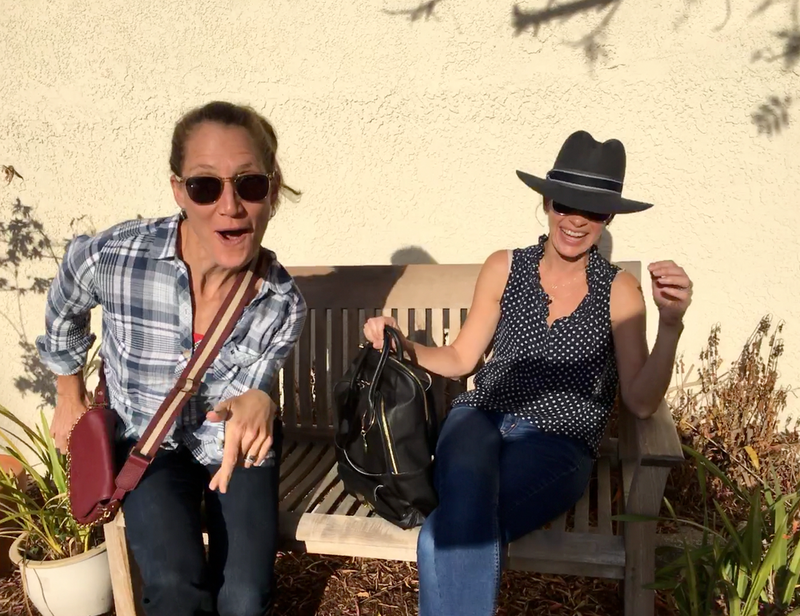 However, even though we fought incessantly growing up, there was one place that was sacred and magically transformed us into the powerful rock solid sister duo we would grow to become, the ocean. I spent hundreds of summer days in the 80’s and 90’s body-surfing and getting sunburned at the South Bay beaches close to my home town of Palos Verdes, CA. I believe in the summer of 1989 or 1990, my step mom, Sally’s top priority was going to the beach every single day of our summer vacation. We might have missed a Wednesday here or there between June and September, but it was close. What I loved most about those days at the beach was playing in the waves with Mary. I am not positive what made our walls comes down once entering the gorgeous Pacific, maybe it was our survival instinct kicking in to protect each other, or the pure joy of being tossed around in nature’s greatest roller coaster? It didn’t matter, I never challenged it, I just soaked up every precious minute that we laughed and enjoyed being together, because it was business as usual as soon as we were back at our house jockeying for shower position. Miraculously, Mary and I are very close today, and have been for years, but I will always credit the ocean for being the first place where she actually wanted to hang out with me, therefore in my eyes, it truly is a mystical and magical place. Since I have a couple of ocean swims coming up on my race schedule, Pier To Pier in early August, and the biggie of the season, Kona in October…. I put in a request to Hillary after I returned from Boulder to add in some ocean swims with SMOG, (Swim Mechanic Open Water Group), a fantastic group of swimmers and triathletes that meet every Saturday in Redondo Beach. I swam a few times with them last summer, and loved it. The group is the brainchild of the Swim Mechanic himself, Bryan Mineo, a sought after private swim coach and incredibly kind person who created an environment welcoming for swimmers of all levels and ages; a tricky and admirable task. SMOG. Photo courtesy of SMOG FB page. The workout last Saturday was extra special because we not only swam, we ran up and down the beach, too. I felt like CJ Parker. :) Honestly, a workout that combines ocean swimming AND running is my version of exercising Utopia. 10 points if you can pick me out of this group. Hint, I am wearing a pink cap. :) Photo courtesy of SMOG FB page. “Do you know if Hillary is running the stairs?” The stunning and super-fit former Olympic swimmer, Caroline Burckle asked me as the crowd started to swell before the workout. “Ahh, oh, I don’t know?” I stammered as my stomach hit the sand just as the thought slowly started to register that my coach might be in the vicinity, and therefore watch me swim; a fate I was not expecting when I woke up that morning. Yes, this would be nothing new, Hillary has seen me swim at various workouts over the years, and during races, BUT swimming is my weakest link, and her STRONGEST, so I am slightly more sensitive about her seeing me swim, verses ride Simone or run. I think my jumpy nervous were justified, because I challenge any athlete who says they do not get a little nervous when performing in front of their coach. “Hillary is here!” My teammate Lynne beamed as I turned out of my nervous daze to see her and our friends circle up on the sand to extend salutations before starting the workout. Once again the ocean worked its magic. My nerves calmed down as soon as the first wave slapped my knees, and I plunged into the salty sea and extended my first stroke; I felt right at home. It was so fun. The workout was a circuit, which included swimming laps around the buoys and entering and exiting the water, and then running 100 yards or so up and down the beach. Hence, my Baywatch reference earlier. (I hope some of you picked up on that). Hillary did finally appear after we completed the workout to give us hugs and words of encouragement, it was wonderful to see her, and meant a lot that she made the effort to come watch us swim while she was in town, but Lynne and I were in a hurry, (we still had a tough bike ride to complete), so I wrangled a quick photo and we were off to tackle the famous hills of Palos Verdes. Post SMOG swim. Starting from screen left, Lynne Fielder, Hillary Biscay, Bryan Mineo, Jenn Aronson, a local, and Lynne Caraway. That was only Saturday, wait until I tell you about Sunday! I am an Aunt to fifteen nieces and nephews, and a step-mother to one amazing daughter. These wonderful miniature versions of my siblings, (and my husband), are quickly growing into fantastic, unique human beings, and as their Aunt/step parent, an adult/parent-type figure, but not their parent, I feel like this is a special time to spend some quality time with each of them. Still, grabbing those moments are like capturing lightening in a bottle due to packed schedules and distance between us, which is why when I saw an opportunity to steal time with my brother, Tim’s kids last Sunday, I took it. Every July by brother, Tim’s family visits us from Europe, (they lived in Basel, Switzerland from 2010 – 2017, and moved to London last August). If you read my book, you know that I have spent time with them in Basel, (I talk about my experience running the Basel marathon in Chapter 36), so if any of my nieces and nephews know that Aunt T loves to run, it is Blake, Jenna, and Kate. However, what has been really fun to watch recently, is that Blake, (fourteen), is starting his own running story, and Jenna, (eleven), is on her way to becoming a triathlete with her impressive swimming skills. When I saw that I had an interval workout, (my favorite), slated for Sunday, I thought I would take a chance and invite Blake along. 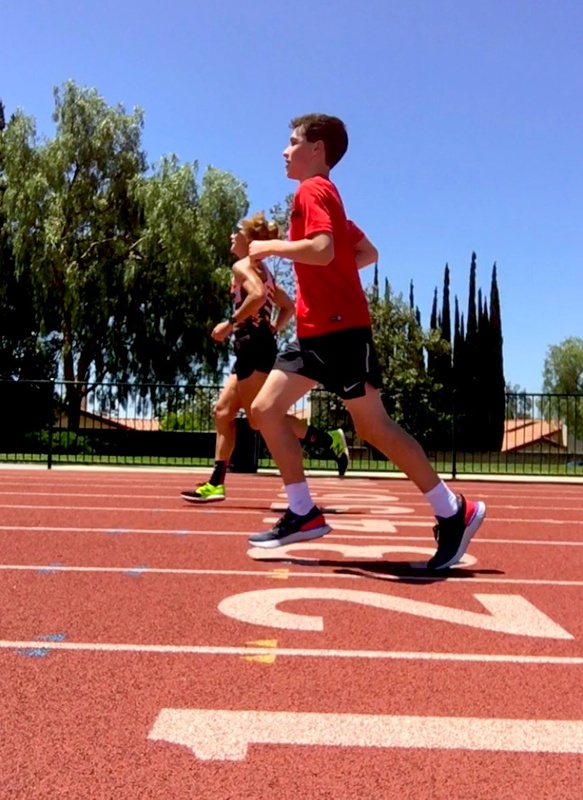 Asking a teenager to hang out with you is a gamble, to my astonishment, Blake agreed to his Aunt T’s running request, and was suited up and ready to hit the track when I pulled up to my Mom’s house on Sunday morning. Yes. Track time with Aunt T and Blake. We ran at the Claremont high School track, and I could tell he was excited to step foot on the same campus his dad walked through so many years ago. The only thing my brother Tim excels at more than being an incredible older brother, it is being a fantastic father. 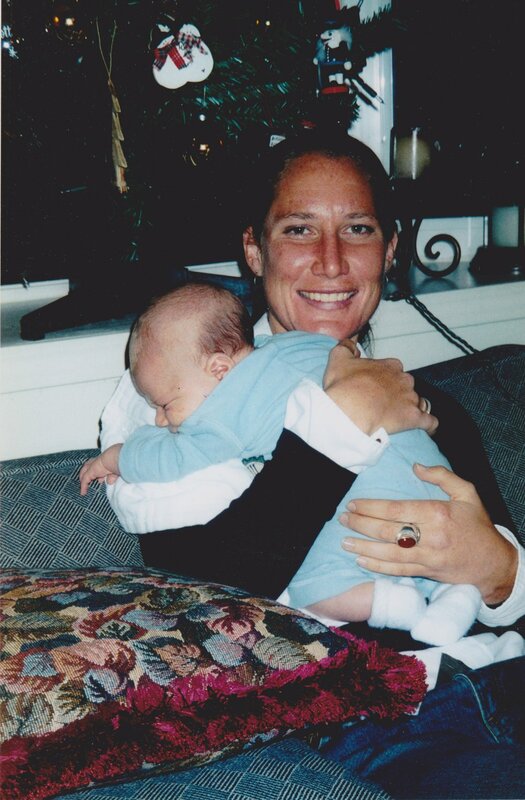 A six week old Blake, with his Aunt T in December, 2003. I will never forget when Tim first announced Blake’s arrival. I was stunned, and beyond happy, because I knew this child won the parent lottery, my sister in law Shannon is a Saint! Tim is pretty great, too. :) I have looked up to Tim my entire life, he is the reason why I started running, (my oxygen), so to share our family passion with his first born was a special moment I did not take for granted. Two Kelly's doing what we do best, run. Blake took to the track like a natural. However, the Southern California midday sun is stronger than the gloomy skies of London, so he didn’t quite run every lap with me, but he did a fantastic job, and definitely has a bright future in running if he wants to pursue it. Next up on my schedule was a recovery swim. Thankfully, my mom belongs to the Claremont Club, a gorgeous facility that has a hair salon, a café, and any kind of exercise equipment one could imagine, but more importantly, they have an Olympic size pool. BONUS: They had the long course open on Sunday. Blake stayed home for this excursion, but my nieces Jenna and Kate, (seven), came along, plus their amazing Mom, Shannon, and their Emmy, too, (my mom). What happened at the pool is still a pinch me moment that I have not quite shaken. Not only did three generations of women in my family swim at the same time, (my mom swam growing up, and took it up again last January), Jenna shared a lane with me! I was impressed with her effortless and efficient stroke, and the joy that glowed from her face during every one of her thirteen laps, (long course), was contagious. I wished that I swam like that when I was her age, but was thankful that I almost swim that well now. I cannot wait to see if she decides to keep swimming and hopefully transition to triathlon, because Jenna may have more grit than every Kelly combined. Swimming ladies. Screen left, Jenna, my mom, Kate, and a proud Aunt. I felt very lucky sharing time and my love for running and swimming with both Blake and Jenna last Sunday, and I can't wait for my day to run, swim, and maybe ride with Kate, too. The Kelly Running Dynasty is strong. Blake and Jenna running together on Monday morning. :) Photo courtesy of Shannon Kelly.